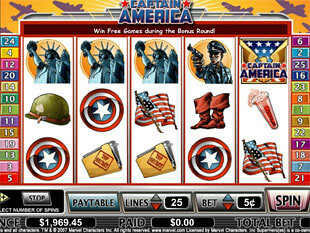 Captain America Slots is a fantastic 5 reel 25 payline video game based on famous Marvel comics. It was released by Cryptologic in June 2007 and by now has already won thousands of fans’ hearts. The game features nice graphics, two bonus games, 3 progressive jackpots by Marvel, and some delightful options more. Captain America Slots suggests you to become a part of the Marvel comics world. In this world Captain America fights for the good future of the humanity. If you want to help the mighty hero, you are welcome to play this game. The prizes awarded to you can reach really huge sums like the top jackpot of 12,500 coins or $62,500. Playing on the reels can get a little bored sometimes, so the developers introduced two bonus features into this game. First, you can try and win Free Spins to enjoy the game even more. Second, you are suggested to fight for some magnificent sums in a Bonus Game played on the second screen. The fantastic game design attracts you to enjoy the world of superheroes. After a couple of spins you will already feel like taking part in the Captain’s adventures for real. Add to this great sound effects, splendid animation, and get ready for spending a lot of time in the Marvel world with one of your favorite heroes. 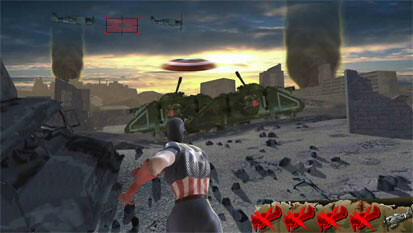 To help Captain America save the world you are suggested to strike a lot of winning combinations with the following symbols appearing on the reels: Captain America, Bucky, dangerous Red Skull, Nazi, American Flag, glossy Statue of Liberty, Top-Secret File, Army Helmet, captain’s Boots, Shield, Test Tube and Captain America Logo. In Captain America Slots it does not matter if you stake much or few. The game allows you to win both with big and small bets. If you like the former variant, it is possible to stake up to $125 per spin. If you prefer the second option, it is possible to make stakes starting from $0.01. The minimal stake also varies according to the number of coins you play with. If you like to make average bets it is also possible to choose the following options: $0.02, $0.03, $0.04, $0.05, $0.10, $0.15, $0.20, $0.25, $0.50, $0.75, $1, $2, $3, and finally $4. This extensive range of available stakes allows you to try and face the fortune smile. The highest jackpot is 12,500 coins or $62,500 for striking 5 Captain America wild symbols. The second jackpot is 5,000 coins or $25,000 for striking 5 Red Skull wild symbols. The third highest jackpot is 2,000 coins or $10,000 for striking either 4 Captain America wild symbols. In Captain America Slots the famous Captain himself works for the wild symbol. If you fail to make a nice combination because one or several symbols are missing on the screen, the mighty hero will come to your help and substitute for the icon you need. 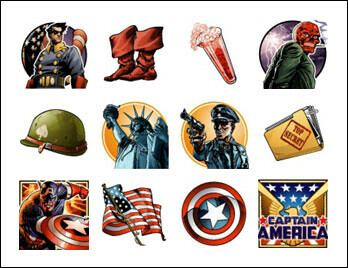 The Captain America wild symbols do not substitute only for the scatter icons of Captain America Logo. You can also win some interesting combinations when 2 or more scatter symbols match on the reels. In this game Captain America Logo fulfills this function. It can appear scattered out of paylines, without any combination. When you match 2, 3, 4 or 5 Captain America Logos the sum of your total bet goes multiplied by 1, 5, 15 and 100, respectively. The maximal winning in this mode is $12,500 when you play with top bets and get 5 scatter symbols can reach. Three or more scatter symbols trigger a special bonus game, where you can win some interesting sums or free spins. This option allows you not only to enjoy the amazing game, but also to win some really serious sums of money. Bonus Game. In Captain America Slots, like in most similar games by Cryptologic, you can win a bonus feature. To trigger this option it is necessary to hit three or more Captain America Logos on the reels. This game is played on the second screen, and you are suggested to shoot down five planes flying in the sky. Every plane defeated awards you a random money prize or 15 Free Spins. Sums you can win in this bonus game depend on how much you stake. Anyway, it is possible to win really big sums: e.g. we managed to get $125 with only $0.20 staked per line. This game, like all slots with Marvel superheroes, suggests you to win 3 different progressive jackpots. They are Hero Jackpot, Super Hero Jackpot and Marvel Hero Jackpot. All these great sums progress right on your screen while playing. You do not need to make any combinations to win them, as all three jackpots are awarded to a random player. Anyway, you can increase the chances for winning if you stake more. 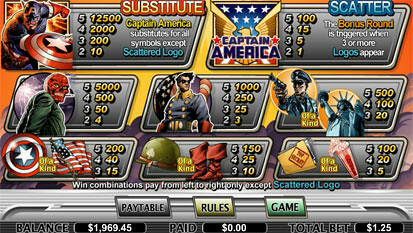 Captain America slot machine is a magnificent Marvel slots allowing you to become a part of your favorite hero’s world. Besides the pleasure of playing this slots game, you can win good sums of money with it. You can do it not only by spinning the reels, but also by winning three Marvel progressive jackpots , along with the bonus game awarding extra cash and free spins.